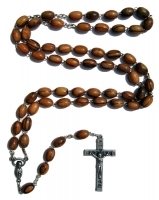 Count your prayers with a string of prayer beads in the form of mother of pearl rosary or olive wood rosary beads for men. Be a complete man and take your religiousness to new heights with a fine and refined collection of rosary beads at HolyLand-Gifts.com. The term ‘rosary’ is directly associated with Roman Catholic sacramental and Marian devotion to prayer and the commemoration of Jesus and numerous events of his holy life on the earth. Feel yourself closely connected to the king of the world and chant his name with fine quality rosary beads made of pearls or olive wood. Rosary beads have a theological significance in devotion and spirituality as they make users feel happy and content when they chant the name of almighty and count their prayers with holy beads. Feel the experience of moving your finger on elegantly crafted and carefully collected rosary beads available at our website.